Today’s Best Ever Daily Inspiration and Journal Prompt is about the The PERCOLATE Process. Whether you have read my book or not, Best Ever You Inspiration and Journal Prompts will help guide you and your lifestyle to be the very best they can be. Following a few of my thoughts you’ll find a journal prompt closer to the end of this blog. I hope you’ll follow with me, as I intend to give us all something to think about and/or write about through Best Ever You Daily. We’re here to talk about brewing your best life in 2018 and beyond. We’re here to learn to make some lasting changes in our lives. For those of you I haven’t met before, I’ve been married to my husband Peter for around 19 years and we have four sons. I’m now an author with Hay House. I started The Best Ever You Network in 2008 one day at work. I sat behind a closed door and started writing a business plan called Best Ever You. Later that week, I quit my job and in a few moments had the support of my family. I had exited a 17 year career in the regulatory compliance/financial services industry and started to embrace my space and move myself in a direction to help others be the best they can be. Here I am. Here we are. Yup. Right here. Let me take you back for a few moments to how I got here. In 1998, I remember my dream to just be ok. I woke up from a near-death allergic reaction hooked up to kidney machines and other equipment helping me survive. In 1999, I was rushed by ambulance in another near-death allergic reaction. Only this time there were two of us to try and save. I was six months pregnant. My son and I survived. I spent many years hoping to just be ok, but what I really wanted was to be alive and thriving. In 2008, I started Best Ever You. I was unsure of what I was doing and how it would be received. I featured my friend from grade school on the BestEverYou.com website. My first radio shows felt like they were reaching vapor and you could hear crickets chirping. Four years later, I signed my book deal with Hay House. A dream and goal realized. Today, The Best Ever You Show on Blogtalkradio has over to 2.5 million downloads and over a million are following me in social media platforms. A dream and goal realized. The dream I share with my husband and kids is for us to live in gratitude. We are. Those are my dreams and goals. What are yours? Like I said, I spent many years just hoping to just be ok.
My goal is for us to be better than just ok. Be Better Than Ok. Be Your Best. I’m here to get you percolating. ​When we Percolate, we gradually improve ourselves and others as our message we share with the world expands. When we are our best self, we touch the lives and hearts of others in positive, compassionate and often enlightening ways. To begin Percolating and be our best, we must first understand that our life opens up when we shift our energy into our passions and talents that tap into our soul. This, combined with developing and using your own set values, goals and a belief and behavior system, will support the lifestyle changes you wish to make to brew your best life. You go where you place your energy. ​The 9 points which make up The PERCOLATE Process in my book will help you ultimately “Percolate Peace,” to profoundly shift your life – and – you’ll have some fun along the way. To begin, grab your notebook or your journal. Ask yourself these questions and write down what comes to your mind. You do not have to answer all the questions. Pick 1-2 that resonate with you for today’s Best Ever You Journal Prompt. What footprints am I leaving? Am I making the world a better place? How am I living my day-to-day life? How do I feel most days? Are there people in my life who have my back and vice-versa? What are my values, goals, beliefs and how is my behavior? Does my behavior match my values, goals and beliefs? What’s the pace of my life like? What are my passions and talents? How do I respond to rejection and criticism? Elizabeth Hamilton-Guarino is a 20-year veteran of the financial services and regulatory compliance training industry. Now, a recognized leader in personal development, Elizabeth is the founder and CEO of The Best Ever You Network, a brand with more than one million followers in social media and over two million radio downloads on The Best Ever You Show. With a mixture of humor and grace, Elizabeth helps people root in gratitude, discover motivation and implement positive, lasting change. An expert in mentoring people to market their strengths and achieve brand excellence, she works with clients worldwide to illuminate their light within, develop their best life and become their Best Ever You with gratitude-based behavior and belief systems. 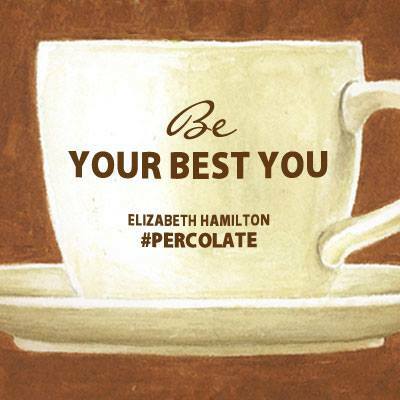 Elizabeth’s book PERCOLATE – Let Your Best Self Filter Through (Hay House, 2014) has been called “charming” by Publisher’s Weekly, with “an ingenious extended coffee metaphor.” Guarino also ranks consistently as one of the top 40 social CEOs on Twitter and was just named a favorite by Oxford Said Business School. Her hashtags #BestEverYou and #TipstoBeYourBest are widely circulated. Elizabeth lives her daily life with allergies to peanuts, tree nuts, fish, and shellfish. In 1998, Elizabeth nearly lost her life due to an allergic reaction to almonds. In 1999, she had a second near-fatal allergic reaction while pregnant with her third son. She co-founded the Food Allergy Zone to find a cure and the cause of food allergies. Elizabeth is a spokesperson for FAACT and MedicAlert Foundation. Elizabeth attended the University of Iowa and is an honors graduate of St. Ambrose University in Davenport, Iowa. Elizabeth and her husband Peter R. Guarino, Esq,. live in Maine with their four sons.